The main types of lung cancer are small-cell lung carcinoma (SCLC), also called oat cell cancer, and non-small-cell lung carcinoma (NSCLC). The most common cause of lung cancer is long-term exposure to tobacco smoke, which causes 80–90% of lung cancers. Nonsmokers account for 10–15% of lung cancer cases, and these cases are often attributed to a combination of genetic factors, radon gas, asbestos, and air pollution including secondhand smoke. The most common symptoms are coughing (including coughing up blood), weight loss and shortness of breath. 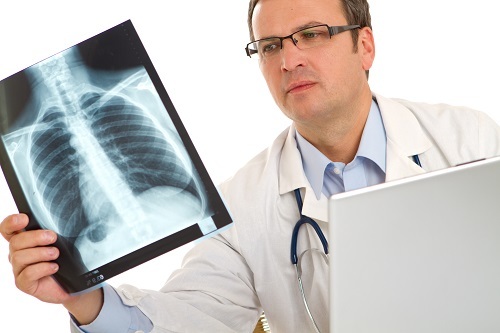 Lung cancer may be seen on chest radiograph and computed tomography (CT scan). The diagnosis is confirmed with a biopsy. This is usually performed by bronchoscopy or CT-guided biopsy. Treatment and prognosis depend on the histological type of cancer, the stage (degree of spread), and the patient’s general well-being, measured by performance status. Common treatments include surgery, chemotherapy, and radiotherapy. NSCLC is sometimes treated with surgery, whereas SCLC usually responds better to chemotherapy and radiotherapy.